John Hancock on Entitlements – Uncle Sam was Crying… Now he's out to change Washington. Governour of the Commonwealth of Massachusetts. I DO THEREFORE, in pursuance of the recommendation of the said General Assembly, and with the Advice of Council, hereby earnestly recommend to the good people of this Commonwealth, to contribute to their abilities, in money, public securities or other property, to this benevolent design, a design which early employed the attention of our venerable fore-fathers. I do request that all money or other property collected, may be paid into the hands of JONATHAN MASON, Esq. Treasurer of the said Society, as a fund to be employed the Society for the purpose of propagating the knowledge of the Gospel among the Indians and others in America, and furnishing the means of religious instruction to those places in this Commonwealth, which are now destitute of the same. And I do further request the Ministers of the several religious Societies within this Commonwealth to read this Brief to their respective Congregations, upon the first Lord’s day after they shall receive the same, and to propose a collection on the Lord’s day next following. 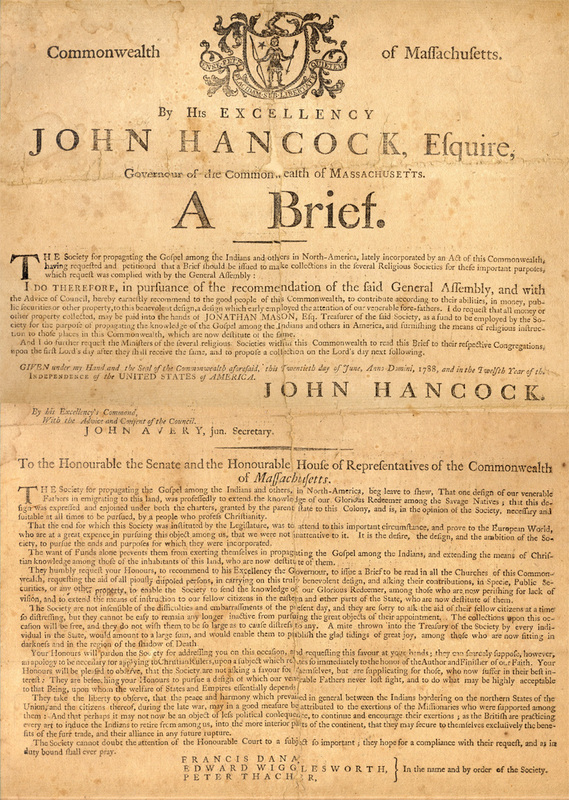 GIVEN under my Hand and the Seal of the Commonwealth aforesaid, this Twentieth day of June, Anno Domini, 1788, and in the Twelfth Year of the Independence of the UNITED STATES of AMERICA. To the Honorable the Senate and the Honorable House of Representatives of the Commonwealth of Massachusetts. The Society for propagating the Gospel among the Indians and others in North- America, beg leave to show, That one design of our venerable Fathers in emigrating to this land, was professedly to extend the knowledge of our Glorious Redeemer among the Savage Natives; that this design was expressed and enjoined under both the charters, granted by the parent state to this Colony, and is, in the opinion of the Society, necessary and suitable at all times to be pursued, by a people who profess Christianity. That the end for which this Society was instituted by the Legislature, was to attend to this important circumstance, and prove to the European World, who are at a great expense in pursing this object among us, that we were not inattentive to it. It is the desire, the design, and the ambition of the Society, to pursue the ends and purposes for which they were incorporated. The want of Funds alone prevents them from exerting themselves in propagating the Gospel among the Indians, and extending the means of Christian knowledge among those of the inhabitants of this land, who are now destitute of them. They humbly request your Honors, to recommend to his Excellency the Governor, to issue a Brief to be read in all the Churches of this Commonwealth, requesting the said of all piously disposed persons, in carrying on this truly benevolent design, and asking their contributions, in Specie, Public Securities, or any other property, to enable the said Society to send the knowledge of our Glorious Redeemer, among those who are now perishing for lack of vision, and to extend the means of instruction to our fellow citizens in the eastern and other parts of the State, who are now destitute of them. The Society are not insensible of the difficulties and embarrassments of the present day, and they are sorry to ask the aid of their fellow citizens at a time so distressing, but they cannot be easy to remain any longer inactive from pursuing the great objects of their appointment. The collections upon this occasion will be free, and they do not wish them to be so large as to cause distress to any. A mite thrown into the Treasury of the Society by every individual in the State, would amount to a large sum, and would enable them to publish the glad tidings of great joy, among those who are now sitting in darkness and in the region of the shadow of Death. Your Honors will pardon the Society for addressing you on this occasion, and requesting this favor at your hands; they can scarcely suppose, however, an apology to be necessary for applying to Christian Rulers, upon a subject which relates so immediately to the honor of the Author and Finisher of our Faith. Your Honors will be pleased to observe, that the Society are not asking a favor for themselves, but are supplicating for those, who now suffer in their best interest: They are beseeching your Honors to pursue a design of which our venerable Fathers never lost sight, and to do what may be highly acceptable to that Being, upon whom the welfare of States and Empires essentially depends. They take the liberty to observe, that the peace and harmony which prevailed in general between the Indians bordering on the northern States of the Union, and the citizens thereof, during the late war, may in a good measure be attributed to the exertions of the Missionaries who were supported among them: And that perhaps it may not now be an object of less political consequence, to continue and encourage their exertions; as the British are practicing every art to induce the Indians to retire from among us, into the more interior parts of the continent, that they may secure to themselves exclusively the benefits of the fur trade, and their alliance in any further rupture. The Society cannot doubt the attention of the Honorable Court to a subject so important; they hope for a compliance with their request, and as in duty bound shall ever pray. FRANCIS DANA, ⎬ In the name and by order of the Society.